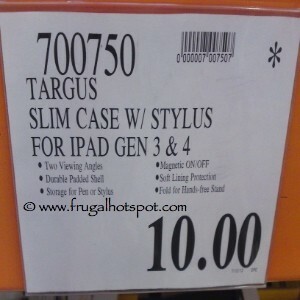 Costco has the Targus Slim Case & Stylus for iPad 3rd & 4th Generation on clearance for $10. That is $9.99 off Costco’s regular price of $19.99. This product is in select stores for a limited time only. This item is not guaranteed to be in stock. Prices may vary by location and may drop further without notice. The Targus Slim Case has a durable padded shell and a slim lining that protects against scratches. There are two viewing angles and has a storage spot for the stylus. The stylus has a soft and durable rubber tip that won’t scratch and works on all capacitive touch surfaces. Looking for something different? Check out Amazon below. While supplies last. This was spotted at the Covington, WA location. Price and participation may vary so it may not be available at your local Costco or it may not be on sale at your local Costco or it may be a different price at your local Costco. Prices may change at any time. This just a posting of the deal at Costco and not an endorsement or recommendation of any product. Please do your own research before making any purchase. Check out my Costco category for other deals, price cuts, clearance and coupon items at Costco.